The Apple iPad Air is now official, Apple’s 5th generation iPad was announced at their iPad press event yesterday, and we have the full specifications and details on the new iPad Air. The iPad Air will be available in two colors, space gray and silver, there is no gold color that was previously rumored, the tablet will be available in a range of sizes from 16GB all the way up to 128GB. Apple’s latest tablet comes with a new slimmer design, it measures 9.4 inches tall, by 6.6 inches wide and is just 0.29 inches thick, it weighs in at just 1 pound, the previous model weighed in at 1.4 pounds. 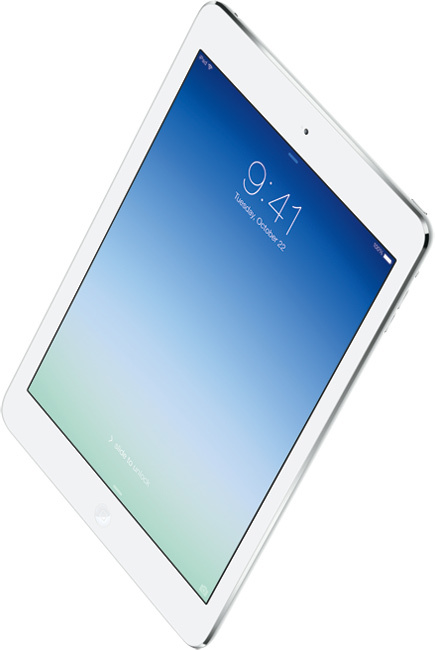 Let us take a look at the hardware on the new Apple iPad Air, the tablet features a 9.7 inch Retina IPS display that has a resolution of 2048 x 1536 pixels. The tablet is powered by the new 64-bit Apple A7 processor it also comes with Apple’s new M7 motion processor, there are no details as yet on how much RAM the device has, we will update these details when they are available. There are two versions of the new iPad, which include a WiFi only model and a WiFi and cellular model, the cellar model comes with 4G LTE. As with the previous version of the iPad there are front and rear facing cameras, on the front of the iPad Air we have a FaceTime HD camera, this camera is capable of recording HD video in 720p and producing 1.2 megapixel photos. On the back of the iPad Air is an Apple iSight camera, this camera can record full high definition video in 1080p, it also can take 5 megapixel photos. The 5 megapixel iSight camera comes with a range of features, which include face detection, a five element lens with a Hybrid IR filter and an f/2.4 aperture. The iPad Air comes with Apple’s latest dock connector, the Lightning connector, it also features a 32.4 watt lithium polymer battery that will give you up to 10 of of usage. 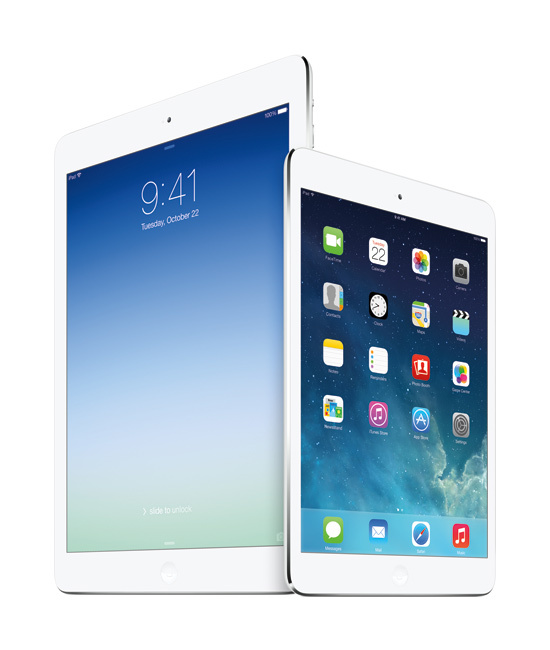 This new iPad comes with the latest version of Apple’s mobile OS, Apple iOS 7, which launched this month, and this comes with a number of built in features, which include Siri, AirDrop, iCloud Keychain and munch more. The iPad Air will go on sale on the first of November, pricing starts at $499 for the 16GB WiFi only model and $629 for the 16GB WiFi and Cellular model. The top end model with 128GB of built in storage retails for $799 for the WiFi only model and $929 for the WiFi and Cellular model, you can find out more details about the tablet, over at Apple at the link below.